Kids these days are way more tech-savvy than we ever were – mostly because, of course, there’s simply much more technology in their everyday lives. But when five-year-olds start asking for laptops for Christmas and toy companies start making computers and MP3 players geared toward the very, very young…well, that just seems wrong somehow. 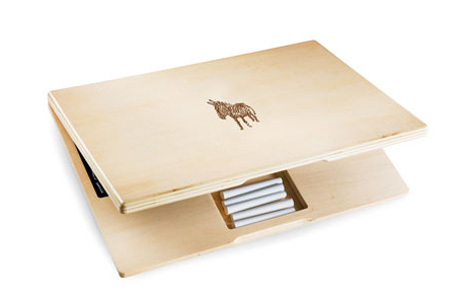 The iWood “laptop” gets back to basics and gives kids what they really need: an outlet for their natural creativity. 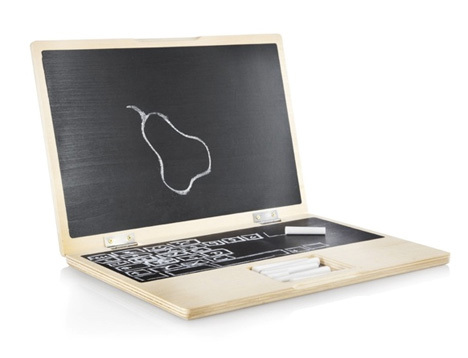 The iWood is a chalkboard that looks just like a laptop. The areas that would normally be occupied by the screen and keyboard both feature chalkboard surfaces, letting your little one write and draw to his heart’s content. 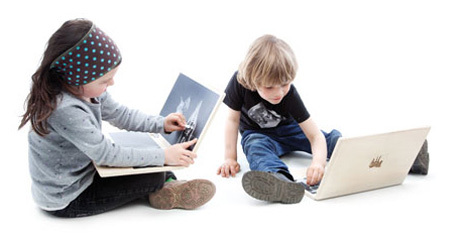 Kids can create their own fantasy laptop or just use the space to draw whatever happens to be in their heads at the moment. The space where a trackpad would be on a real laptop functions as a chalk holder on this toy, keeping the writing implements always close at hand. Kids can enjoy hours and hours of unfettered creativity without relying on cartoon characters or mind-numbing video games. But if we’re being honest, you’ll probably buy this so your kids will stop hogging the TV and video games and let you get back to your own games, right? See more in Computers or under Gadgets. October, 2011.